I wish more people in this house were brave enough to try the neti pot, it would solve an awful lot of whining and sinus problems. I gave Addie a crash course in ‘how not to drown while using a neti pot’ and we were off…the kid was FASCINATED to see giant globs of snot come flying out of her nose. “MOM! I FEEL BETTER! I CAN BREATHE! YOU WORK MIRACLES! BEST! MOM! EVER! THANK YOU!” In fact she was so thankful I didn’t bother with the “Imagine how much sooner you would have felt better had you done this three days ago when I first suggested it?” speech and just took the lavish amounts of praise and pride that came from my kid trying something new and weird. Cody and I also had a dog for about 24 hours. 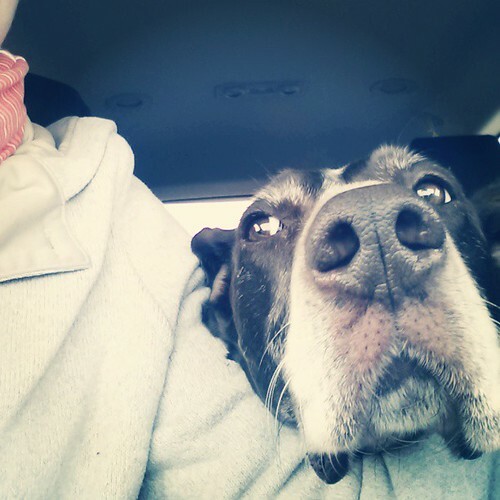 Well, Cody had a dog for about 72 hours, he picked her up in Michigan while I was still in Texas at my conference. We took her back yesterday because we were clearly not meant to be her family. I’m still working on the messy emotions that come from feeling like a total failure at something, neither of the cats are eating and Wink lost at least 2 of his remaining 6 lives over the weekend. Poor guy. I kind of wrote about the experience in a sneaky political way over here. I want to thank every single person that I was able to hug last week, I genuinely meant it when I said hello or howdy and I so hope you never felt alone or left out. I’ve heard rumors that a lot of people were disappointed with the sessions at Blissdom this year. Want to know a secret? Me too. Kind of. I’m a HUGE believer in “you get out of something what you put into it” and there were a few sessions I sat in on where I needed to change my perspective. While I may have not learned to use my camera any better, I certainly learned to approach the entire act of photography in a way I had never thought of before, for this I am thankful. However, I can imagine there were some people stewing that the session description didn’t match up with the material and for that I’m sorry. 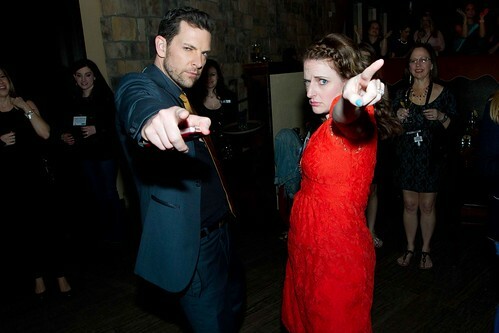 I do hope you found something redeemable about the weekend whether it was the connections you made, the music on Friday night, dancing with Chris Mann, a keynote speech or not having to change diapers for three days. My darling friend Lindsay told me to read this book after she read this post I wrote about Addie and her quiet little ways. In a very serendipitous sort of way I stumbled on the book at an airport and it has forever changed my life. Susan Cain, the author of said life changing book, spoke at Blissdom and she is just as lovely (if not more so) in person than she is in her book. Read it. Do it. Now. I am currently obsessed with this woman’s Instagram feed, it’s taking all the restraint IN THE WORLD not to heart every. single. photo. she posts. Are you following me in Instagram? Easiest place in the world to get more one eyed cat and Vivi photos into your day, I’m mooshinindy. I was a new BlissDom attendee and it just about made my whole conference that you made a point to introduce yourself on Thursday night. You were welcoming and friendly and meeting you was a perfect way to start my BlissDom. @Sarah @ Toddler Summer, Ah! I’m so glad you had a good time, I’ve never been brave enough to go to the newcomer thing and put myself out there before. I’m so happy I did this time. And dude? The neti pot? She’s eight and only JUST NOW figured out I know EVERYTHING. I did see you at Blissdom! You could have made it better for me by delivering a cookie to me every hour, on the hour. Regarding Neti pots: I have never once used one successfully. I’m convinced my nasal passages don’t actually connect to one another. @Nichole, I loved seeing you. Ever since that nap in Ashville, you and I are bonded forever and ever. I could have used more cookies too. BUT NOT THOSE SNEAKY ONES WITH THE RAISINS. BLECH. @Nichole, Pretend I spelled Asheville right. breakfast was awesome. come back to texas soon! @Bethany, IT WAS AWESOME! I wish I could have had you there the whole time, like a lovey. 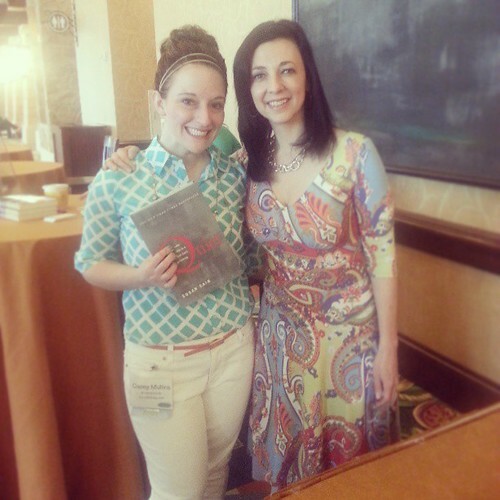 I love that you got to meet Susan Cain! I watched her TED talk on Introverts and loved it, you should watch it. Taught me a lot about my quiet daughter. I havent read her book yet, but it’s on my list! @Kelly, Oh I’ve watched it, you MUST read the book, it will bring it all full circle. loved our long and lingering lunch with the cutest little baby on the planet. do you think her mom has noticed i stole her and took her home with me, yet? i promise to teach her to neti early in life and to interpretive dance and talk about her feelings. i’m also a firm believer in adjusting expectations on the fly and making the most of every session. this year i got a very different set of somethings out of blissdom, but i was grateful for every one of them. @dearabbyleigh, She didn’t notice you stole her because I stole her first. You have an imposter baby. @jenny, I sure do like you. I figured out the perfect adjective for you today, effervescent. I’m just glad you got your chocolate chip cookie… even if we didn’t get to share it. P.S. Texas (and Blissdom) look good on you. @Stefanie, I had so. many. cookies. @Jennifer Patrick, You too! Can you imagine if we could *really* get to know everyone there? That would be amazing. Even if others said it wasn’t as great as previous years, I wish I would have made it this year. Hopefully next year. My life will be less hectic (financially& physically) with Sierra being in college next spring. Glad you were a good sport in greeting the newcomers. That’s the Casey I know! I have instagram too! Follow me girl! @rose, It would have totally been your scene, you would have been right at home. I TOTALLY saw you at BlissDom. And I think we even chatted for a little while. Now that I’m here at your place, can you explain how you are a Dad Blogger — as one of those sidebar ads suggests? Whaaat? This was my first BlissDom, and I gave up on the sessions and decided to just network. That took a bit of time to figure out, but I’m glad I did it. Were classes much better in the past? I’d be interested to hear about that. I did find them rather remedial. My BlissDom post is up now if you’d like to come take a peek! Glad you enjoyed your time. And yes, Susan Cain was fabulous. @Renee Schuls-Jacobson, Heh, my husband blogs for Babble, he represents the full time working dad as best he can. Classes were better in the past, this year was a bit of an experiment and it didn’t go as well as planned. Glad you were able to network and make the best of it! And my workstudy boss totally showed me that book! He likes to make fun of me for being incredibly quiet sometimes. I’m not all the time… but it’s kind of my natural state… I may have to find that book. @Sarah, Totally find and read the book. I see neti pots and a needed evil, like eyebrow threading and Brazilian waxes. 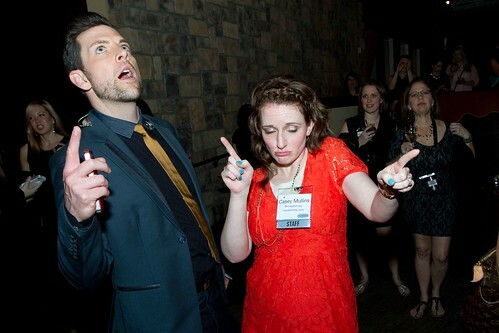 I know I saw you at Blissdom, but you always looked busy and snapping pictures with your camera. Hopefully next year, I’ll actually say hi. @Natalie, I’m never too busy to hug and meet new people! I do love that you’re already planning on next year. aaawww, you’re darling! NO YOU. I saw you at Blissdom and at Girl’s Night Out while I was off filling my plate with un-ladylike amounts of chip+queso you kept my friend company so she wouldn’t be alone. It was so unbelievably sweet of you! Being new, it was a little tricky finding my place, but knowing there were other bloggers out there making it better really says something about Blissdom and YOU! So, thank you!! @Megan, Aw, thank you. That was kind of an awkward moment. “Hi! ARE YOU LONELY? I’LL BE YOUR FRIEND!” then the two of you sweep in from the sides like the secret service. (I just bought that book. I’m married to an introvert and my daughter is one, too. @Kylee, Which is why I read it…introverts, I’m collecting them. @molly, You wouldn’t believe how much better conferences are when you’re mentally stable. I KID YOU NOT. I hope I do get to see you again at one. I have still never made it to a blogging conference though I do think that blissdom would be my choice if I ever did make it. @Marta, Atta girl. I’d be first in line to hug you like crazy. @Casey, oh my lol I have horrible problems with my sinuses so maybe I should look into it. I’m allergic to my house. I’ve read that book and I love it. Because it’s so me. I wish everyone would read it for the sake of all the introverts in the world. Stop trying to make us something we’re not! @Adri, I thought of you when I read it. Also the comment you made about shy vs. insecure when it comes to physical appearance. Wise words Adri, WISE WORDS. I saw you a lot, but you were working. You looked great, as always! @Anne (@notasupermom), working = probably sometimes avoiding social interaction. Shh! So I’ve been lurking for years, and I appreciate you from afar- but today while fighting the most evil cold known to man, I see this post and I’m like “if an eight-year-old can saddle up and use the neti pot, I can too.” Went to the store, got a kit (and ice cream as a reward/consolation) and tried it. I now type to you, clear and happy. Thanks bunches! @Wendy, This makes me so incredibly happy. I’m still shocked she volunteered to do it but she did it three times (willingly!) and has felt better ever since! Thanks for coming out of the shadows!! How in the world was I not following you on Instamatic??? I dream of getting to Blissdom. Maybe next year. @Colleen, Right back at you. Next year, yes. Fingers crossed. @Biddy, Yeah. I’m really sad about that. You’re honestly one of the people who popped up in my head when Texas was announced. That’s amazing that Addie was brave enough to use the neti pot! I’m not brave enough to use one and I’m almost a grown up! I feel like I could really use one right now, though. Someday I’ll be brave enough. Someday. @Katie, Addie volunteered to give you lessons. I don’t blog so no conference for me. But cookies!! Oh and I adopted a kitty Wednesday. So sorry it didn’t work out with the dog. I hope the cats recover soon. The sunshine should help, right? E-mail being sent as I type this…Happy Friday! I included pictures of my dogs too. You know so they don’t feel left out. They are smaller than my cat in size. I totally hit reply before I mentioned the Neti – we found a Neti-Squeeze so all J has to do is bend over rather than tilt her head to the side with pot. It has been LIFE changing!! So I think I needed more cake – didn’t you promise me that? It was super fun to meet you. Blissdom was overwhelming but good. Susan Cain? LeSigh… Her TED talk changed the way I view myself. In a good way. I think. There was not enough cake at that conference, but thankfully there was plenty of cookies and pie. OH MY THAT PIE WAS GOOD. Lovely to hang out with you my darling. I love the picture of that dog’s face.